As i said in my previous posting, for too long, turnips have been considered food for the poor and destitutes. The Japanese have come with all kinds of ways to prepare them forthe pleasure of vegans, be they Japanese or expats in this country. 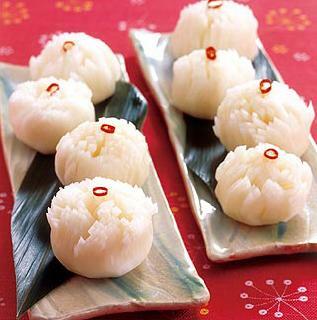 Japanese pickled Turnips in the shape of Chrysanthemums! -Peel the turnips carefully and take out leaves and their green spot from the top of the vegtables. With a sharp knife make incisions two thirds deep all around the top of the turnips. -Place the turnips side by side inside a bowl. Cover them completely with salted water. Leave them marinate for 15 minutes to soften them. -Mix rice vinegar and sugar. Pour the sweet vinegar over the turnips and let marinate for a whole night. 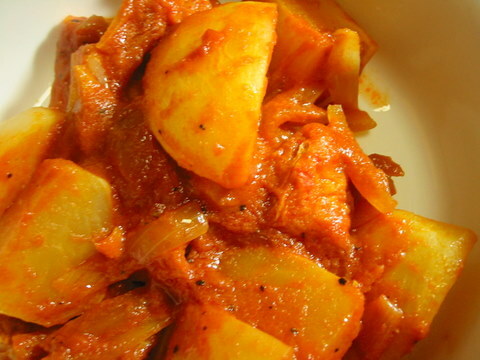 -Take turnips out and press out the vinegar only lightly. Open and spread the indented parts as to give tem the shape of a looming flower like in the picture. Top with a small circle of cut chili pepper. Enjoy as a snack any time of the day or use as a central part of a vegetable salad!